Ai, kwani you thought only celebs can tell us what’s in their bag? Anyway, I didn’t know what to write and I just had to write something to keep these juices flowing. Even though there is a purse specifically existing to hold these, I am not disciplined enough to put all of them there. Plus, who knows someone might grab the purse. I’ll still have enough money to go home. Takeaway: I am not organized. I am paranoid. I cannot believe SwiftKey does not have Chinua Achebe on autocorrect! Anyhuuuuu, I have not touched it since Saturday. Every time I think of taking it out, I’m either squeezed on a matatu seat like now or in bed watching American Odyssey (which was cancelled). I’m yet to get to any juicy part due to these reasons. Takeaway: I don’t like traditional books given my circumstances. Give me an epub any day. B had the guts to tell me that I have no need for a notebook in my life. The nerve! I have one of those office point notebooks divided by multiple colours. That’s where I jot down important stuff that needs to be done in the near or far future. That’s how I feel I’m planning something important. All those apps for planning niliwaachia. Takeaway: I am as traditional as they come. Honestly, I only use this like once in two weeks. Seriously. I don’t even know why I got it. Initially I was on them lip balms that you roll out of the tube. In the spirit of 2015 adventure, I went ahead and got this one months ago. Caramel. First time I got it on, I felt like my lips had been nibbled by mice. I’m not kidding you. Takeaway: Stick to what you know. Sometimes, there’s a reason. 5. Fay Facial tissues. Fay wet wipes. Handkerchief. First of all, I have not been paid. Nah ah. I just like Fay. Not because they are that different from everything else really but because I loove the ad on TV. Best. Ad. Ever. Okay, fine. Not really. “Siphrosa” is kinda fake in that one. Clearly fake tears. But the idea is epic! Anyway, I just like Fay. It’s familiar. Oh, also their social media campaign some time back about public toilet positions – – awesome. Handkerchief? I have been having strange nose-blowing bouts, even though my cold came and went weeks ago. Takeaway: Advertising can be awesome. Advertising that enforces an already existing use, awesomer. Update: I’d written Fa before for some strange reason. Until my “editor” Jim corrected me this morning. I can’t even explain why. Their slogan is Fay it away and I still wrote Fa. Smh. Eeer because a notebook needs a pen(s). Lots of cards. Business cards. AAR card. ID card. KCB card. (Btw, they called me after last blog post. Hehe. Profuse apologies. Money refunded. Pepea card explained. Friends made at Kikuyu Branch. Maybe, just maybe, I am not moving after all. Also, I have not been paid to do this too.) NSSF card. Takeaway: I am grownup, just in case you were wondering. Lol. No idea why in the world I keep stacks of these. Sometimes, I end up having them piled on a shelf for no reason. Takeaway: My sentimentality makes no sense sometimes. Because you never know with the weather these days. You know, those ladies who would rather soak wet but ensure hair is completely dry? Us those. Takeaway: At least it’s not a Naivas paperbag. Obviously Shindroid 2.1 is in my hands. Need I explain why I need my Samsung devices? Plus my earphones are in my ears. USB cable, never left behind. Today the two have had a nice wash during my loo break. They are white. They get so annoyingly dirty most times. I couldn’t stand it. 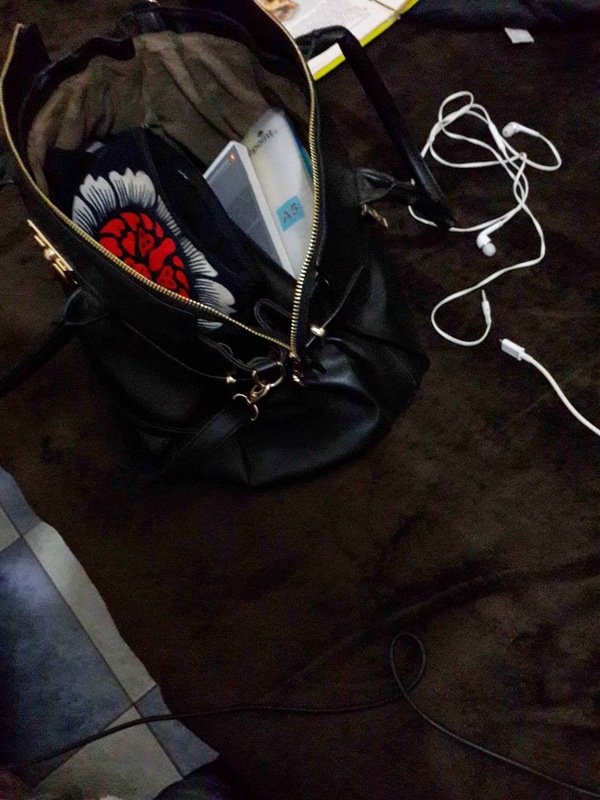 Takeaway: Phones reduce like half of what should be in my bag, including books, watches and diaries. House keys. You know you’ll never be chased out of the house when your dad gets you your own copies. Office keys. Takeaway: No need. You have keys in your bag/pocket too. Say it with me. Shame on you Shiku. Yeah. And I am chewing on the gum left from the first one. Long story. I wanted change for the matatu. Figured only way was to get credit and lollipops. Don’t judge me. They are just really sweet. I blame my brother, Kim. Takeaway: Do not take sweets from relatives. Because my pixie will not let me have peace. Sometimes I sit really badly in the office and I look like I was in the middle of a whirlwind. My hair, that is. Takeaway: I fuss over dead cells too much. The end. You were waiting for makeup ama? Lol. Trust me, this a huge step up from the Shiku of laptop bag. Ask anyone from campus. Sometimes, on bad day, you’ll find a maize cob in there, or a sanitary pad. Duh. Today is just a good day. All I picked up here is you had a chance to leave KCB but didn’t. Why would you be so cruel to your mental state? Those guys are a headache. I should also blog about my ordeal if that is what it takes for them to help. Hehehe. Chill out. Blog about it and cc me. Lol. Nitupe hotspot yangu kwanini sasa? Eish!.. KCB called you? Hihi! Talk about the power of blogging. Whats in my Wallet !? I havent replaced my KCB atm card simply because am bored and lazy and again you already killed the motivation to do so! Lol! You still have the old ATM card! There’s a time I would only use Bank to M-Pesa after my card was swallowed by the ATM. But that was my fault. I forgot my PIN.